Much has been written about the famous competition that pitted Lorenzo Ghiberti against Filippo Brunelleschi in 1401-2. The San Giovanni Baptistry in Florence ran a design competition to decide upon who to award the commission of the Baptistry's Eastern Doors. Delightful entries were submitted by both Ghiberti and Brunelleschi. 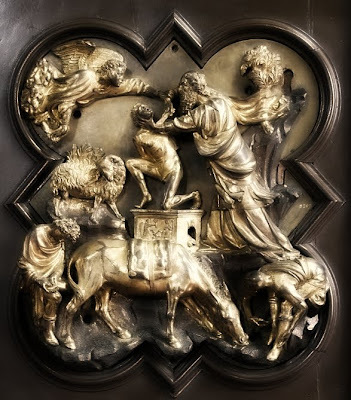 There is some controversy over who was proclaimed winner, though it is known that Ghiberti executed the commission on his own, with Brunelleschi subsequently travelling to Rome to study the architectural forms of antiquity. 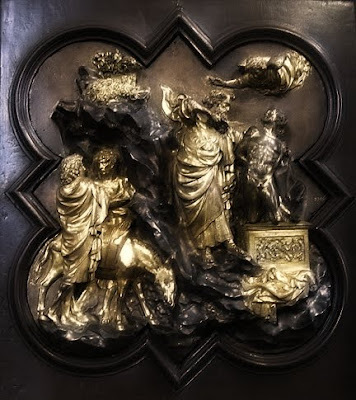 Ghiberti's competition panel, also depicting The Sacrifice of Isaac. 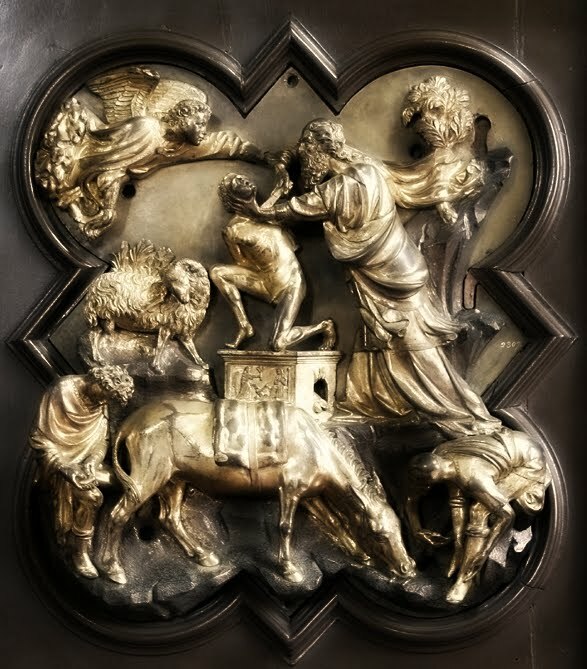 The following clip is presented to supplement the Ghiberti's North Doors post at the wonderful Alberti's Window. In this post, Monica points out a common misconception about the present-day North Doors at the San Giovanni Baptistry in Florence. These doors were originally the Eastern Doors, and should not be confused with the famous Gates of Paradise, also at the Baptistry. Read Monica's post for more information! The following clip is taken from the NHK Production, Art Museums of The World, whose feature on the Bargello in Florence contained this wonderful sequence. Thanks so much for linking to my post! I actually did some more research on the competition this evening, and found out more information about Andrea Pisano's doors (and the nature of the 1401-02 competition). You'll notice that I added a little bit more information to my original post. This clip is great! I didn't realize that Brunelleschi and Ghiberti were so close in age. Glad you enjoyed the clip M! Over the years I have been collecting Art related programs on my PVR. This series doesn't seem to be readily available for purchase, so I'm glad I hung onto it! I can't believe they were only 23 and 24. It makes me feel like a real slacker! I am going to have to be on team Brunelleschi. There is something about the way he organized the figures that really moves your eye around. great post! And thanks for sharing the video. Cheers Vicky and cb :) Many more great vids will be featured in future - stay tuned! Somehow I found your blog quite randomly (searching for a good photo of the restored Donatello bronze david) and see with pleasure that the blog I write for the region of Tuscany, Tuscany Arts, is in your list of favourite blogs! Thanks so much! Yours is wonderful and very in depth. Hello Alexandra :) Thank you for your kind words. I found your site when researching the Caravaggio exhibition currently at the Uffizi. Your site has been very helpful in finding out the many artistic and historical attractions in Tuscany. Keep up the great work!